LOLC Micro Credit Limited (LOMC), Sri Lanka’s largest and only microfinance provider to have received the prestigious certification for Client Protection Principles, is a subsidiary of the LOLC Group. The company recently launched a social responsibility initiative to uplift the facilities of Kilinochchi Maha Vidyalam in the Northern Province. Kilinochchi Maha Vidyalam is the largest school in the Wanni, known also as the heartland region of Sri Lanka. While the school’s student population significantly fluctuated during the conflict years, more than 2600 students now attend on a regular basis and over 100 Government teachers serve on the staff. As part of its social responsibility agenda, LOMC refurbished the computer laboratory of Kilinochchi Maha Vidyalam and donated twenty (20) desktop computers with a view to making ICT accessible to the students of the school. As phase one of the CSR project, the playground of Kilinochchi Maha Vidyalam was redeveloped and trees were planted under LOMC’s island-wide tree planting programme. Sharing his sentiments about this worthy cause, Mr. Ravi Tissera, Director/CEO of LOLC Micro Credit Limited said, “LOMC has been active in the Northern province since 2009 and strong bonds have been forged between our borrowers since then. We continue to uphold these relationships by going beyond the customer perspective, through many livelihood support programs and this CSR project is a demonstration of our continuous support to the communities in which our customers live in. At LOMC, social responsibility is considered an intrinsic part of our business and supporting education has always been one of the highest priorities in our CSR agenda. In line with this, we have entered into a long-term support programme with Kilinochchi Maha Vidyalam and accordingly we have agreed to continue to improve the facilities of this school in the future as well through the donation of books to the students and school library, further development of the school playground and reward the caretakers of the trees that were planted in the school premises, under the LOMC island-wide tree planting programme”. 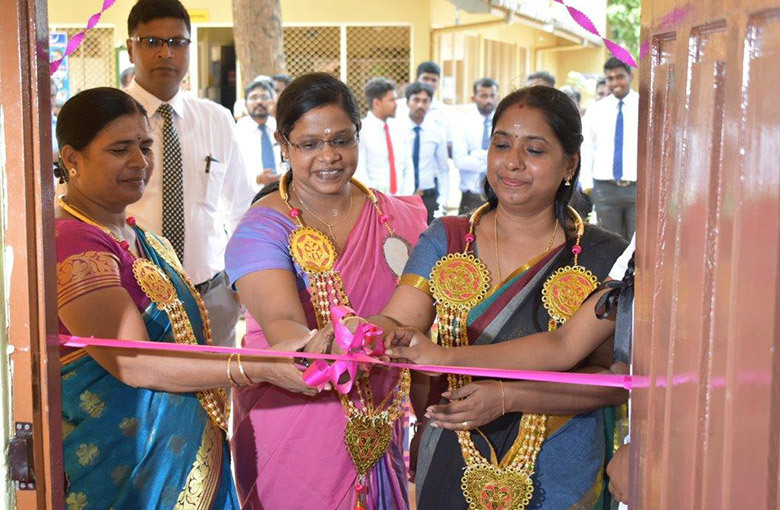 Speaking about LOMC’s CSR initiative, the Principal of Kilinochchi Maha Vidyalam, Mrs. Jeyanthy Thanapalasingam said, “We can clearly see that LOMC is not a company that has limited itself to being a mere microcredit provider with financial targets. Instead, they are taking the extra step to nurture ties with communities, supporting not only their financial requirements but also extending a helping hand to fulfil their social needs and aspirations. In my view, these are the qualities of a true corporate citizen and Kilinochchi Maha Vidyalam is privileged to work with an organisation like LOMC. I take this opportunity to thank the management of LOMC and the staff for their untiring support towards this worthy cause that has given our students the access to a better tomorrow”. Since the establishment of LOMC in 2009, the company has empowered, innovated and created livelihoods and made an enduring impact in many communities throughout the country. Backed by the LOLC Group, the largest non-banking financial conglomerate in Sri Lanka, LOMC has evolved to become the largest microcredit provider in the country with a disbursement portfolio of Rs. 56 Billion and a growing borrower base of more than 440,000. By empowering the rising entrepreneurs to overcome the income disparities found at the grassroots level, LOMC continues to make a significant contribution towards poverty eradication and subsequently, towards the overall socioeconomic development of the country. The Company is also the first and the only Sri Lankan microfinance institute to be awarded with the certification for Client Protection Principles. Today, LOMC’s unique business model which promotes sustainable development from within the rural based communities it works with is well accepted not only in Sri Lanka but in many other countries in Asia.